I've literally been working on this post since January. It's that I take photos incidentally, which means that I don't really plan on wearing one thing or another. So if incidentally I am wearing one product that I eventually want to put on the blog (and weather, lighting, skincare murder mystery face all cooperate), then I take a photo. Also since I am feeling ambitious (for a sloth), I wanted to put all of these eye shadow palettes into one post instead of cranking one post on each color like the plippity plop of .... well, never mind. The pans of each trio follow a similar, if not identical format. Left pan is a shimmer or glitter shade in a sheer base. Three out of the four I own (Iris Pop, Apparel On and French Jasmine) have a dense shimmer finish in a matching sheer base. Dark Raspberry is a riotous glitterfest. Each adhere very well on the skin but the application benefits from a tapped on method (with a fingertip or a flat brush) versus a brushed on one. Middle pan is a typical pressed powder either in a matte or near matte and highly pigmented. The blue shade in Iris Pop stained my skin, as well. Aside from the high pigmentation, most applied smoothly but I found the red shade in Apparel On the patchiest. Right pan is a pearl or satin with moderate pigmentation. It is also a very interest formulation. It appears to be the same paste formula of the cheek colors. It's neither a wet mousse (like a Tom Ford cream eye shadow) or a dense spongy cream (like a CHANEL Illusion D'Ombre). It really is a paste. It gives when you press and softens up with warmth from the skin. Works well applied with a fingertip or a brush with firmer hair. Which colorful trio appeals to your inner magpie? Here's a little write up, swatches and a look for each of the four Refining Eye Shadow Triple. Each look was inspired / straight out copied from what JSM Beauty shared on Instagram / Youtube / website. All the names of these trios seem a little whimsical and nonsensical to me. Not sure what "Apparel On" means. Maybe a love of fully clothed, non-naked makeup lovers? This trio's most striking aspect is that bright red matte shade. As mentioned earlier, it's a bit dry and patchy compared to the matte strip in the other trios. 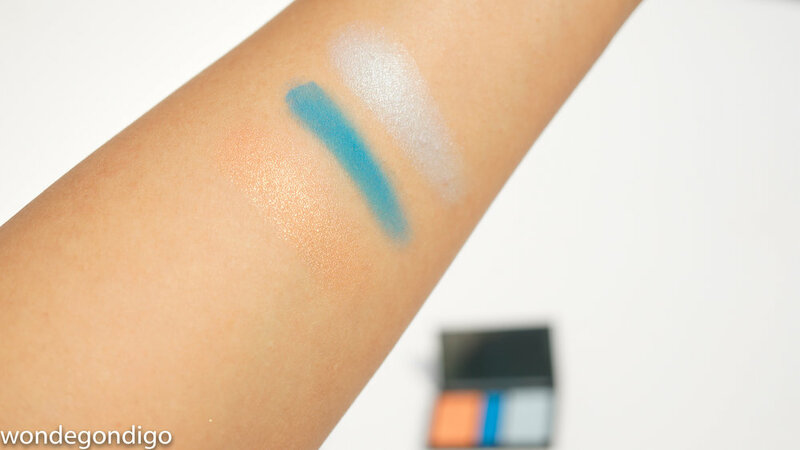 The paste shimmer and pale mint are both very light colored, though with decent pigmentation. Pale warm pinky beige with pink, silver and white shimmer. a pale shimmery mint shade that can be built up to near opacity, but looks best applied sheerly, in my opinion. Whenever I wear red on the eyes, I'm always amazed that it is a lot more wearable than I would ever suspect. Maybe its the years of beauty blogging, but years of wearing non-neutral colors seem to have broken down my reserve over wearing a red. The placement here is using the red as a liner accent and beige on the upper lid. It's almost subtle with mint placed on the lower lash line. 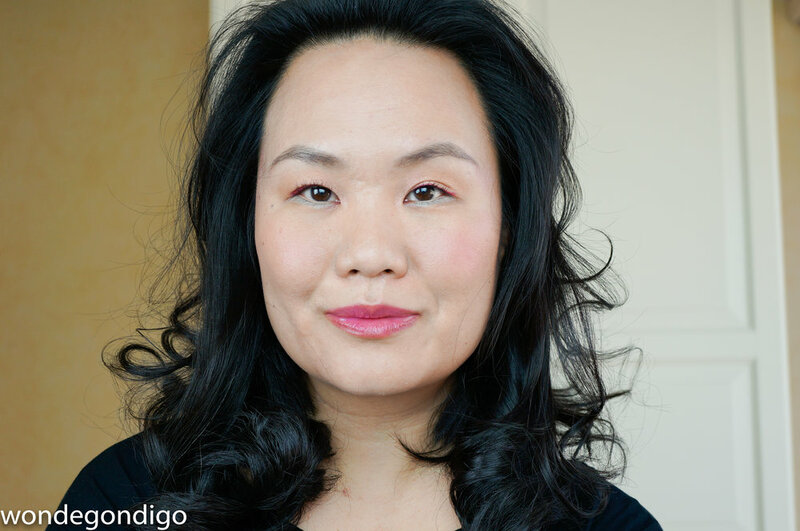 I'm wearing the Essential Tinted Lip Glow (a tinted balm) in Pink Glow, and a discontinued Laduree Blush. I like blue + orange color combinations. It sort of reminds me of a school uniform colors. Or as a Queens girl, Lets go, Mets! I have to say that this trio deeply disappointed me (kind of like the many years of being a Mets fan), I was hoping for a bright primary blue, but it was a yellow-based teal and that's not a good blue for me. I prefer purple-toned or indigo blues. a bright teal blue matte. This one caused a good bit of staining on the skin after removal, fyi. Goes on very smoothly and very full pigment. This trio appeals to my annoying habit of starting sentences with "so." Why is it SO French something versus just Regular French Jasmine? Why? 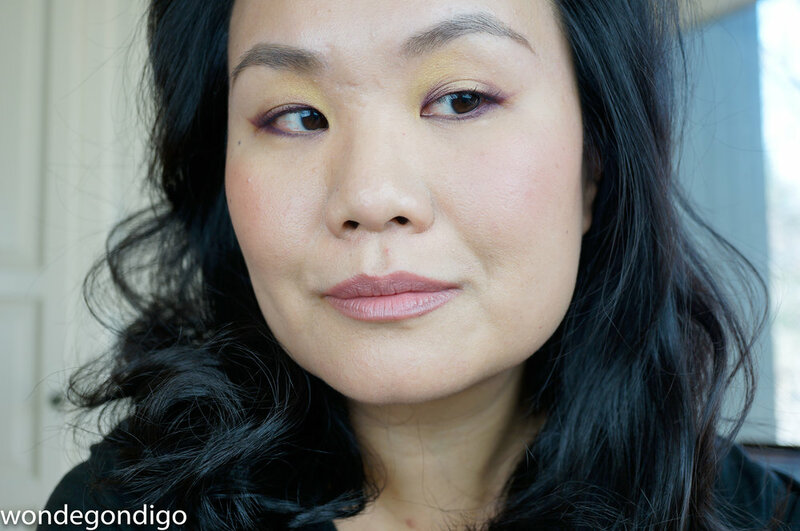 Yellow might be slightly unusual as an eye shadow color, but if you had seen Lisa Eldridge's recent video on wearing yellow eye shadow (here), you know there are ways! There are two yellows here, which exemplifies the JSM method of creating depth. 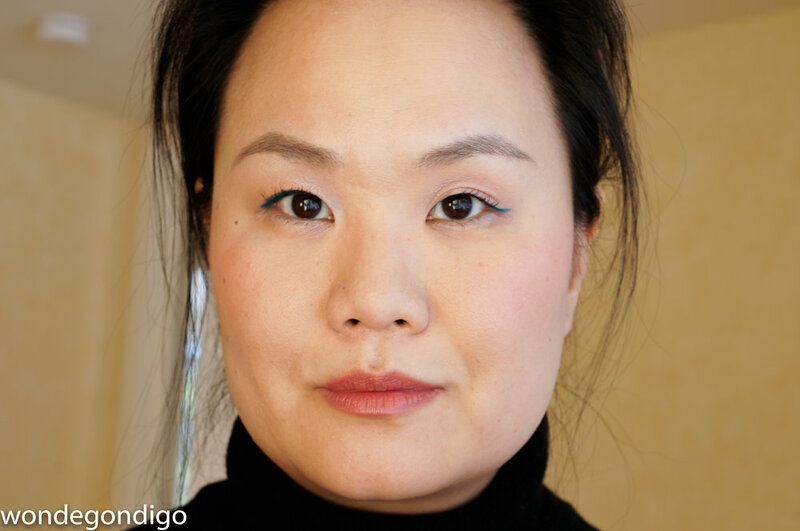 In this case, using two similar colors to create illusion of light and shadow on the lids. This is an idea I like because I have very flat eyelids and using tonal variations to create depth is a neat trick to employ. Pale cool lemon yellow with loads of cool yellow shimmer. Deep satin oxblood. This is a gorgeous shade with strong purple and brown tones. I wish the pan was much larger. A weird mustard yellow satin shade. I used the purply oxblood to line and wing out and also in the inner corners and also in the crease for a graphic effect. The pale lemon was on the mobile lid and lower lash line and the mustard yellow was mainly placed in the inner portion of the upper lid. While the other trios have the high shimmer paste pan, Dark Raspberry has the high glitter pan on the left. 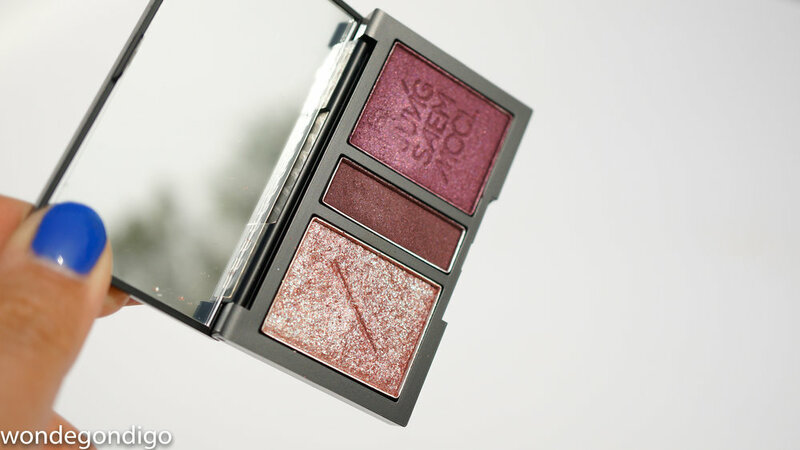 It looks like from the range, several others have this format of two similar looking shades, plus one glitter pan. I'm not sure that the intense aqua of the glitter shows very well in these pictures, but let me assure you: HUBBA HUBBA. I am disappointed in these swatches! The glitter shade doesn't show the duo chrome effect of the aqua, but when this shade is applied heavily, it is very apparent. I don't quite get the color composition of Dark Raspberry though (or some of the other ones like Fuchsia Fantasy, Blue Blade and Parrot Green). While you can see in the pans that the middle powder shade has a more brown undertone compared to the more raspberry pink tone of the right pan, when swatched on the skin, the difference is minimal. It also looks like one is just a lighter version of the other. Sheer brownish raspberry shade with generous dose of glitter (aqua, silvery white, dark pink). It has a duo chrome effect with the aqua to raspberry brown shift. Little fallout on application but some fallout during the day. Deep matte reddish brown. This one shade applies really beautifully. Very deeply pigmented and easy to blend. Satin raspberry brown. There's a lot of blue and purple fine shimmer in this one. A very pretty shade. This is pretty straight forward placement. I used the right side all over the lid up a bit past the crease and lower lash line. I used the middle shade to define a bit around the upper and lower lash line. I generously patted the glitter shade all over the place and in the inner corner using a flat weasel brush. I thought it would benefit from a slightly darker crease, so I used Rouge Bunny Rouge Papyrus Canary mixed with Chestnut Napped Apalis in the crease and blended well. 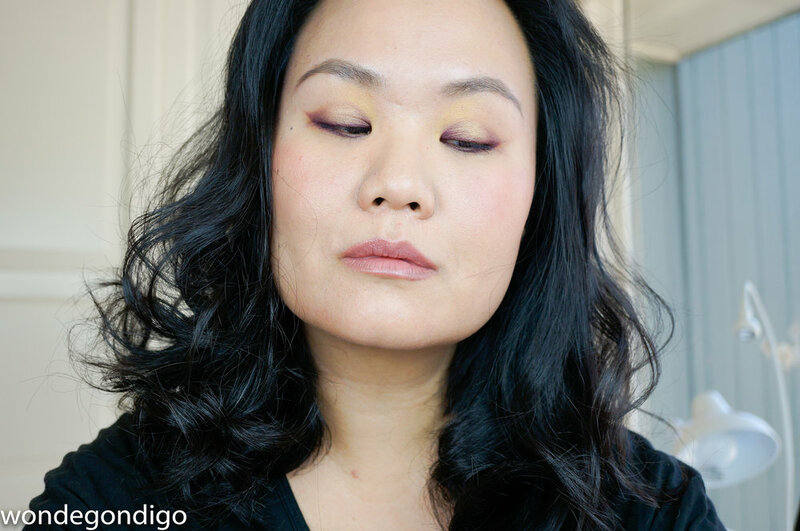 || JSM Beauty Essential Cheek blush in Pale Lavender & JSM Beauty High Color Lipstick in Rare Plum (reviewed here). I really enjoy using these. It's very fun incorporating non-neutral and bright colors. I love JSM's approach to color combination and her take on texture. The pastes are very interesting to use. I just hope they don't dry out any time soon. I've probably maxed out on these particular trios and wouldn't likely add more to my stash. The others are more along the line of Dark Raspberry with saturated mono-color stories with glitter. I think of those, Dark Raspberry had the easiest appeal for me. I do own a bunch of the neutral duos! I'll work on putting those up soon. Those are kind of more wearable, but each of those have a glitter pan as well. What do you think of Jung Saem Mool's beauty line? Are you intrigued? JSM Beauty Website (you can purchase if you are in Korea) here. The English website is information with excellent swatches here. Lotte Global website, which is where I ordered here. Look for coupons within the site you can "clip" to apply to your orders to reduce the huge shipping cost. Doesn't always apply to every item. Hyundai Global website here. I've not ordered from here, but it looks like there are coupons on the website as well. Apr 25 Super Special Rouge Bunny Rouge Giveaway - with Snow Woman Stickers!